Inverter manufacturer Sungrow has recently introduced its PowCube battery storage system into the Australian market. 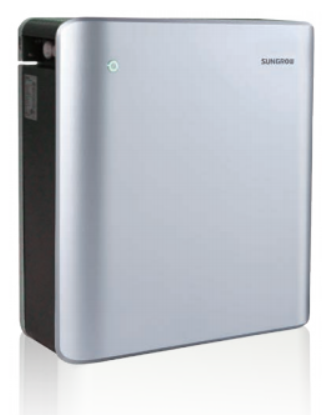 The PowCube system consists of a Sungrow SH5K Hybrid inverter and up to 3x SPB4K8 battery units, which have been developed as part of a joint venture between Sungrow and battery manufacturer Samsung SDI. The PowCube system promises to be among the most economical and flexible of the battery products available on the Australian market – especially for homes installing a new solar system or replacing the inverter on an existing one. In this article we’ve summed up what you need to know about the Sungrow PowCube. Sungrow is a China-based power technologies manufacturer that has had an office in Australia since 2012. The company has gained a reputation for its affordable yet reliable solar inverters, and is one of the biggest players in the hybrid space. The PowCube is a battery that has been designed to work specifically with Sungrow’s inverters, and as such each PowCube package consists of a) an inverter and b) a maximum of three battery banks. Although it is in a way a kind of ‘all-in-one’ package, it is differentiated from other ‘one box’ solutions like Tesla’s Powerwall 2 and sonnen’s eco in that the two main components are physically separate, lending the PowCube greater flexibility in its applications. When talking about rooftop solar systems, an inverter is a device that transforms the DC electricity generated by solar panels into AC electricity, which is used by devices in your home and by the electricity grid. Some solar inverters can handle batteries as well (as batteries store electricity in DC form); these are referred to as ‘hybrid’ inverters. PowCube batteries (whose model name is SPB4K8) come in sleek, metallic grey enclosures that are approved for mounting on walls or floors (IP 55 – more about IP ratings). The batteries cells are manufactured by Samsung SDI, one of the world’s largest makers of lithium batteries for a range of applications. The chemistry used in the PowCube cells is lithium NMC (nickel-manganese-cobalt). Each unit has a usable energy storage capacity of just about 4.5 kilowatt-hours (4.5kWh), and a single inverter can handle up to three of them for a total capacity of about 13.5kWh. They have a peak power output capacity of about 3.3kW, which is enough to meet the needs of the average home using a moderate amount of electricity. The batteries have a cycle life of 4,000 cycles, which works out to just over 1x cycle per day over the product’s 10-year warranty period. By the end of the 10 years, or the end of the 4,000 cycles, the battery is warrantied to retain at least 70% of its original capacity – which means it should still be able to store at least 3.15kWh of usable energy when either of these milestones is reached. The warranty does not specify – as some others do – exactly how the battery’s storage capacity will degrade over time (e.g. how much you can expect at 5 years / 2,000 cycles), nor does it mention any energy throughput figures. What about emergency backup power? 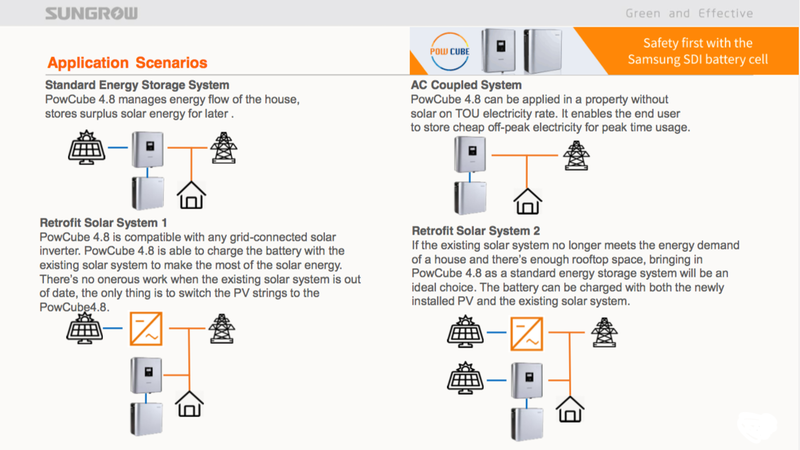 Because the PowCube package consists of a hybrid inverter, it has a number of potential applications & installation configurations – which means the price structure will look slightly different depending on your situation. The three most likely scenarios & corresponding pricing are outlined below. Brand new, ‘battery ready’, grid-connected solar system. 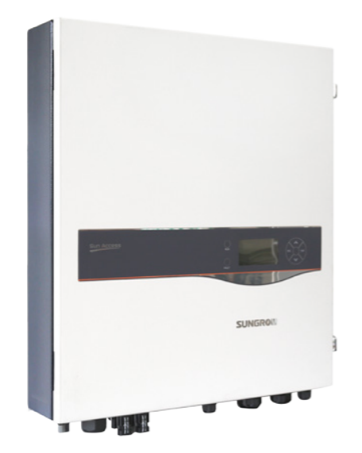 The SH5K Hybrid inverter can be installed as the solar inverter for a standard (no battery), grid-connected solar system so that the SPB4K8 battery can be added on at a later date (n.b. LG Chem RESU batteries are also compatible with the inverter). In this case, the inverter might cost you a premium of about $500-$1,000 over a system without a hybrid inverter. (The typical cost of a fully installed 5kW solar system in Australia is between $4,500 and $7,000. See more current solar system prices here.) Total costs could come out to about $5,000-$8,000 (plus $5,000 for each additional battery). Brand new, grid-connected solar system, complete with battery. Here, the SH5K Hybrid inverter serves as the hub of the system, managing both inputs from solar panels as well as charging/discharging of the battery. In this case, the inverter might cost you a premium of about $500-$1,000 over a ‘standard’ system without a hybrid inverter, while the batteries will each cost roughly $5,000-$6,000, installed. (The typical cost of a fully installed 5kW solar system in Australia is between $4,000 and $7,000. See more current solar system prices here.) Total costs could work out to between $8,500 to $12,500 (plus about $5,500 for each additional battery). Add on battery to system with pre-existing SH5K Hybrid. This is the simplest scenario, and one of people who planned ahead for batteries by installing a hybrid inverter ahead of time. Each battery unit will cost roughly $5,500 to supply and install. Add on battery to system without pre-existing hybrid inverter. It is possible to retrofit the PowCube onto existing solar systems regardless of whether they have a battery-ready inverter already, but doing so requires the addition of an SH5K Hybrid unit – either alongside or as a replacement for the pre-existing inverter. In this case, the PowCube package will cost roughly $8,000 to supply and install (plus about $5,500 for each additional battery). Expand solar panels and add battery to any pre-existing solar system. Many Australian households seeking to add batteries to their homes already have a pre-existing and fully functioning solar system on their property. However, many of these systems are relatively small by today’s standards – for example, only 1.5kW or 2kW as opposed to 5kW (which is the norm these days). The PowCube package allows these households to install the SH5K inverter (usually alongside their existing inverter) and then add both new panels and batteries to this side of the system. The basic cost in this scenario is $8,000 for inverter & 1x battery, plus whatever the installer charges for the additional solar panels. Battery installed without solar. For households on a time of use (TOU) electricity tariff, it is possible to install a battery without solar purely for the purpose of ‘tariff arbitrage’ – where you charge up the battery with early morning ‘off-peak’ electricity in order to discharge it during more expensive peak & shoulder times. At this point in time this option doesn’t make fantastic investment sense (as solar is usually cheaper than off-peak electricity), but as battery prices come down this approach is destined to become more attractive. The PowCube package in this case would cost around $8,000 for the inverter and 1x battery. Electricity networks (the companies that run the ‘poles and wires’ portion of our electricity infrastructure) around Australia are putting restrictions on the amount of solar that households can connect to the grid without special protections. The most restrictive to date is the case of SA Power Networks in South Australia, where households may only install a maximum of 5kW per phase (most homes are connected to the grid on a single phase). For SA households interested in batteries, the best approach will be to install a system with a 5kW hybrid inverter, which will earn them a stamp of approval from SAPN. Similar considerations will come into play for networks in other states as well (we’ve compiled a table of the limits here). For some time now, we’ve been scanning the market for battery products that balance quality and price, and it seems that the PowCube performs this balancing act fairly well. While the battery’s cycle life – at 4,000 cycles – is not as high as some (e.g. LG Chem RESU batteries are 6,000 cycles and the batteries in sonnen’s eco series are 10,000 cycles), the PowCube is still covered by a comparable 10 year warranty and has a reasonable ‘end of life’ retained capacity of 70%. These are decent performance specifications, and owners should be able to charge/discharge there PowCube batteries on a daily basis without voiding their warranty. Where the PowCube stands out is flexibility and price. Each battery unit has a storage capacity of 4.8kWh (4.5kWh usable), making it a good ‘starter size’ for virtually any household interested in installing batteries but not wanting to commit to something as large as Tesla’s Powerwall 2 (13.2kWh usable). On the out-of-pocket costs front, it compares very favourably to most other on the market in this size range, coming in at about $1,100/kWh for the battery only, or $1,780/kWh for the inverter/battery combo. According to Solar Choice’s own Battery Storage Price Index for December 2017 (which did not include anyone offering the PowCube), the cheapest ‘battery only’ solutions in the 1-5kWh range came in at about $1,440/kWh, while the lowest ‘whole package’ prices were around $2,000/kWh. If the indicative retail prices I’ve used above carry through to the real world, the PowCube package is ground-breaking in that it will be the first widely available, small-scale battery bank that can pay for itself within its warranty period. If you’re not aware already, it’s helpful to know that there are basically two types of electricity tariffs in Australia – flat rate and time of use. Under a TOU tariff, using electricity towards late afternoon ‘peak times’ will cost you more per unit, while other times of day (and overnight) will be cheaper. Solar energy peak output time does not always coincide with peak electricity consumption time, which is what makes batteries so attractive – solar energy can be stored for release during peak pricing times. Running the numbers through our Solar & Battery Sizing & Payback Estimator, it’s pretty clear that customers on TOU would see better outcomes than customers on a flat rate (this isn’t really news). Meanwhile, if you’re installing a fresh new solar system with batteries right from the outset, a package that includes the PowCube could be one of your best bets for making batteries worthwhile. For a total cost in the range of $11,000-$12,000, you may be able to install a 5kW solar system with 5kWh of battery capacity that will pay for itself in a bit more than 7 years (with the ‘battery only’ portion having a payback of just over 10 or 11 years). 5kW solar system for $6,200 (incl $1,000 premium for hybrid inverter) plus $3,500 for battery. Conclusions: Is the Sungrow PowCube worth it? Sungrow’s PowCube comes across as a decent quality battery storage system with one of the most competitive price tags that we’ve yet to come across here at Solar Choice. The fact that the system is comprised of separate battery and inverter components also means that it is very flexible in its applications – for a brand new solar+storage system, as a ‘full’ retrofit to an existing system, or as a ‘simple’ retrofit to an existing solar system with the right pre-existing Sungrow inverter. The units will be most attractive for customers installing them as part of a brand new system or as a simple retrofit to pre-existing solar system equipped with a Sungrow hybrid inverter. For those in the market for home solar batteries, it’s definitely an option to consider seriously. More generally, we’ve worked out that the best approach to battery storage in Australia is to install a system with a hybrid or ‘battery ready’ inverter. Because a hybrid inverter handles both solar and batteries, it helps to reduce the equipment-related costs of a solar+battery system. Having a hybrid inverter (most of which are sized at about 5kW) also allows systems to comply with grid connection limits in even the most limiting circumstances (e.g. 5kW limit per phase in South Australia). We look forward to seeing the PowCube – and products like it – offered more broadly in Australia’s burgeoning battery storage market.